I receive many questions about Internet access for deployed soldiers to Afghanistan and Iraq and hope this information will be a help. Keep in mind your soldiers should always find out before deployment what is available at the deployment location. Internet access in Afghanistan and Iraq is delivered via satellite broadband. The Internet signal is received through a special satellite VSAT modem which is usually set up in a building or tent. Internet access for soldiers in Afghanistan and Iraq is usually available via the following methods. Internet cafes – Available at some bases. Soldiers can expect to pay $5 to $10 per hour for use and spend time waiting their turn. MWR (moral welfare and recreation) – Most deployment locations have an MWR. There are usually a few computers for free Internet access and sometime wireless is available. Troops are allowed 20 – 30 minutes pers session and there is usually a wait. If they bring your own computer and use the wireless, they may experience the slowest Internet ever because so many people are trying to share the bandwidth. 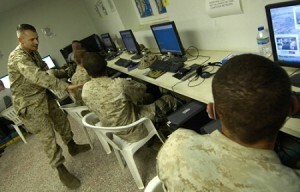 Personal Internet access – Soldiers can have Internet access in their living quarters. It is very expensive. The Internet access and expense is shared with other soldiers. I know of one example in Afghanistan where many soldiers share the Internet bandwidth and expense of $60 per month per person. Another situation in Iraq, each person pays $100 per month. It just depends on how many people are sharing and what the cost is per month. With personal Internet access, each soldier has their own laptop computer and all access is wireless.The soldiers are typically responsible for getting the equipment up and running. If your son or daughter is getting ready for deployment, they should find out ahead of time what will be available at their deployment location. Soldiers in remote outposts do not have access to Internet. Internet access is a morale booster for deployed soldiers! We are fortunate to have Internet access available at all. In previous wars, letter writing was the only form of communication and letters were received every few weeks. I am thankful for Internet for deployed soldiers! HOOAH! I think Obama needs to make a way for that one access for soldiers….i mean damn they are over there for him!! It is truely a disgrace. Welfare receipents (the people in america who do not work) get $70.00 dollars a month for cell phone service from our hard earned tax dollars. BUT, our soldiers who protect us and make peanuts doing it pay $70.00 a month for communication. Come on somthing is really wrong here. I too think that the internet should be payed off by someone else and not the soldiers. Those prices are pretty expensive and these soldiers are over there for the nation. The last thing they should worry about is having $10 in hand in order to reserve a spot at a cafe or shelling out $100 of their own pay. But still, the Internet is such a gift. 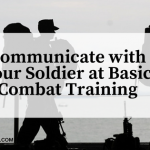 Communication with our loved soldiers is key! Well the prices on this article are so wrong. I am in Iraq, the prices range from $70-250 a month!! Don’t ever bother getting the $70 dollar a month because you will never be able to talk to your loved ones back home through skype or any other web-chat service. Most soldiers, I’d say about 80% of the ones I know here in Iraq, pay $110-$150 a month and it is still not worth at all…at all! I have created a group on Facebook against these Internet providers (Sniperhill and TigrisNet) If you have FB you should join my group lol. The name of the group is…. Screw Snipper Hill and Tigris net, The Worst internet providers EVER! Thanks for your comment. The prices in the article are not wrong. These prices were based on facts from my son. It was what he paid in Afghanistan and another soldier gave me information about what he paid in Iraq. The prices are different from location to location. And for the $60 a month my son paid, he was able to use skype most of the time to talk to those back home. Regardless, I agree, it’s all way too high! I’ll check out your group. What is the name of an internet provider in Afghanistan? So confused! My son is there. I have a more personal question. Is it normal for the military to ask me to pay approx $300-500 for VPN secured access to talk to a soldier via video chat? What equipment would they need to have their own personal access? My son is currently in Afghanistan and is able to use facebook messenger to video call me once a week, but the internet is so bad the call is often disconnected. He has his personal laptop with him. Every situation is unique depending on what is available at their location. I am trying to find out if this person is a real soilder or a scammer who asks for money to have his funds transferred to my bank account. He’s ment to be in Kabul with the army. It is 2018 and I am very confused regarding what troops being sent to area’s like Kuwait and Iraq are doing over there. I also have no idea how or what is okay to send him for his birthday, any suggestions of what is okay would be helpful. Gift cards are out mainly because he said he cannot really use them their. Is this site still operational. I have been ill so it is the first time I have been out of the hospital and feeling well enough to sit in front of the computer. Evelyn. Yes this site is still operational. We have troops in over 150 countries, all with slightly different missions. 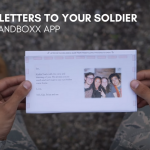 As for what to send your soldier, the best way is to ask him what he needs since every deployment location is unique as to what they can and cannot have.